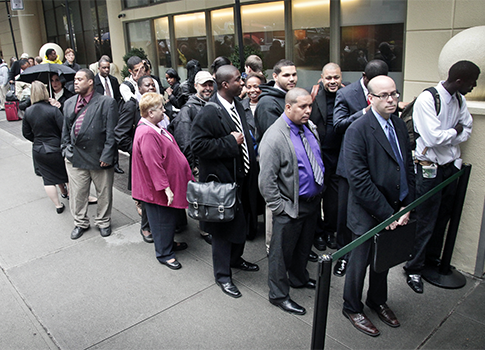 Without an extension of unemployment insurance as part of a fiscal cliff compromise, more than 2 million Americans, or roughly 43 percent of those receiving unemployment benefits, will lose Emergency Unemployment Compensation (EUC) benefits at the end of the year, according to a report from the Department of Labor. The Department of Labor has estimated that 2,147,100 (approximate 43 percent of recipients) will lose EUC benefits in January unless benefits are extended. This figure is higher than the number of beneficiaries as of the latest data: 2,008,608. Recent reports have suggested that the executive branch may exercise certain administrative authorities to mitigate or otherwise spare individuals from the impact of the fiscal cliff in the near term, such as through the use of IRS withholding tables that assume current tax policy is in place. However, current law does not appear to provide for any mitigation to the 2.1 million individuals who will lose, virtually overnight, unemployment compensation they were receiving during the holidays. As such, when public officials such as Secretary Geithner state with confidence that the administration is prepared to go over the fiscal cliff, they must do so with the full knowledge that they will be taking over 2 million Americans with them. This entry was posted in Politics and tagged Fiscal Cliff, Obama Economy, Tim Geithner, Unemployment. Bookmark the permalink.